2008. Having not released any various-artists compilations in the past decade, Hypnos released in 2007 a new compilation Sounds of a Universe Overheard featuring a diverse array of ambient soundscape artists from around the world. We are proud to follow last year's release with its "mirror image" compilation, which we believe meets or exceeds that high standard. Here are another 10 exclusive tracks by 10 artists who have not appeared on Hypnos compilations before, though some of these artists will certainly be familiar to followers of our label. 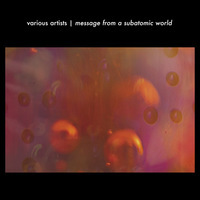 Message From a Subatomic World in comparison to its predecessor is perhaps a bit more abstract and deep-space, more mysterious and strange, whereas Sounds of a Universe Overheard is a bit more musical and structured overall. Austere - This elusive duo has released two albums with Hypnos, Solyaris on Hypnos and Pulse on Hypnos Secret Sounds. They've also ranged over a wide sonic territory with previous self-released projects during the past decade. Evan Bartholomew - Perhaps best known for the rhythmic electronica he records as Bluetech, Evan has just recently started releasing ambient work under his own name, and launched his own Somnia label. Numina - Numina has released 3 great CDs on our label, and he has been one of the great names in the ambient music world this past 5 years. Jason Sloan - A partner in the Slo.Bor label with Matt Borghi, Jason creates uncompromising sound art using tools as diverse as electric guitars, synthesizers, and self-designed software algorithms. Phaenon - Real name Szymon Tankiewicz, his debut album was released on the Malignant label, and he has relocated from his native Poland to Maryland, USA. Stephen Philips - Stephen runs the Dark Duck Records label on which he has many releases under several identities, in addition to his two releases on our label. True Color of Blood - Alter ego of Eric Kesner, who uses treated and layered electric guitars to craft unique and challenging ambient drone works, which he has released on labels like Gears of Sand, Eibon and Afe. Svartsinn - This Norwegian dark ambient artist has several prior releases, mostly on the Cyclic Law label, and is a frequent live performer around the world. Oophoi - No other name has gone from obscurity to such high regard among ambient listeners in such a short time, and this Italian master of the atmospheric drone has been greatly prolific, counting among his releases several projects on Hypnos, Athlit, Distance to Zero with Paul Vnuk Jr., and The Martian Chronicles with Seren Ffordd.